Confession time: I am in my mid-thirties and I cannot swim underwater without plugging my nose. It's fairly hard for me to admit that, considering I grew up with a dad who was a charter boat captain and I spent a tremendous amount of time at the beach. Also, my best friend had a pool with a diving board. She was like a mermaid in the water, as though it were her natural habitat. Up and off the diving board she would go, into the air, cutting through the water and popping up on the other side, always trying to get me to go next. I could swim, don't get me wrong. I still can. Not Olympically, or anything, but I can get from point A to point B without drowning. I can float for hours, like I'm made of water-wing plastic. But if I turn over and put my face in the water, I immediately feel that burning sensation in my nose and I choke and sputter and I have to get out and do something on dry land for awhile before I get back in. Forget your good intentions, and do not offer to teach me because "it's so easy" or "I just haven't gotten used to it yet" or whatever other well-meaning platitude you have. It's not going to happen. 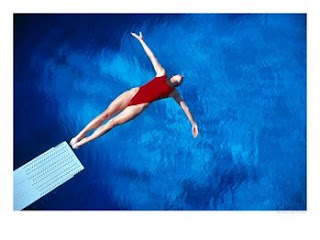 Yet, I remember fully the feeling of standing on the diving board, toes curling over the edge, and staring down into the 9 feet of blue to the rings on the bottom that it seemed everyone could recover but myself. Despite my inability to accomplish the perfect bubble-blowing maneuver that would allow me to swim underwater like my companion, I could open my eyes while I was down there. I could swim with one hand. I could do one-handed handstands in the shallow end. So what was holding me back from jumping off, grabbing the ring with one hand, and emerging victorious? She would see me plug my nose as I jumped off. She would sense my fear. I didn't have the same abilities that she did. And, more than anything, her taunting older brother whom I of course had an enormous crush on would see me as well, and never, ever let me live it down. I crawled off the board, went back to the shallow end, and walked around pretending I had no interest in deeper waters. I've been doing that my whole life. The problem is, that's nothing more than living a lie. Being crippled by pride, or living in fear of the unknown, fear of failure -- it's pointless. Anxiety over something that may never happen and, in all honesty, probably WILL never happen, is the high-flying banner of a life wasted. I'm sick and tired of standing on the edge of glory, of hanging on a moment of truth, and then backing off and walking away, whether it's out of fear or pride or laziness. Every moment is a new beginning. Our destiny is an amalgamation of God's plan for us and the choices we make. There is absolutely nothing we can change about our past. We cannot change our actions, our reactions, our choices, our decisions, our accomplishments, or our mistakes. Our life hinges on our present and our future. Allowing ourselves to become crippled by bitterness and resentment, by pride or fear, or letting our past dictate our current actions, reactions, choices, or decisions is an exercise in futility. What does every red-blooded American do on December 31st? They write a list of resolutions, things they want to change in the upcoming year. By the end of a few short weeks, they've given up again, thinking they'll wait until the beginning of next month, or until their birthday, or until next January 1st to start trying again. I reiterate: Every moment is a new beginning. If you were driving down the interstate and you turned left instead of right, would you continue on your incorrect path thinking that, eventually when you drove around the entire world, over mountains and through the oceans, you'd end up where you wanted to be? No, you would turn around the moment you realized you made the mistake, cut your losses, be a slight bit off course, and end up where you wanted to be a few minutes late because you'd made a bad choice, but you fixed it as soon as you realized it. Yeah, the other people in the car might laugh at you a little, you might hear an "I told you to turn right! ", you might have to hear about it for a day or two as they told the story to some other people, but in the end, you'd end up where you wanted to be instead of Timbuktu. I'm telling you this from the bottom of my heart, because I need to follow the very same advice. If you are not on the right road at this very moment, turn around. Throw your pride out the window, ignore your fears, admonish your anxieties, and turn around. If I could stand on that diving board right now, I would hold my breath, plug my nose, and do a cannonball to the bottom of that pool, open my eyes, grab the ring, and swim one-handed to the surface. I can't go back and do that now. But I can learn my lessons from the past and let them shape my future.